Stop the flip-flops and utter flops, Mr Abbott, put your mind to helping women at home. In another fabulous action-packed week of fantastical spinning, bewildering back-flipping, delusion, parliamentary hullabaloo and other outward manifestations of ‘good,’ ‘adults-in-charge,’ open for business, government, its multi-million dollar turd-polishing media unit was in overdrive. Abbott’s avid fascination with Goebbels lingers on like a fart in a sleeping bag, a noxious emanation impossible to disown or disavow. Every flip and flop of the Abbott government’s flip-flops and total flops of unworkable, unpopular or utter nonsense policies were presented with fanfare and at great expense to an increasingly alienated nation as ‘positive new’ and ‘exciting new’ policy initiatives to be drooled over by sycophants such as Piers Ackerman, Miranda Devine and the craven conservative apologist, Greg Jennett on ABC TV whom we hate for replacing the insightful, wise and independent Lyndal Curtis who was always good value. ‘On the cards,’ we are told, is the despatch of Tony Nutt, a ‘political fixer’ who looks a bit like his former boss John Howard might if he had impacted wisdom teeth, to Abbott HQ to redress the Credlin captivity in line with Rupert’s orders and as a sop to foolish backbenchers, many of whom have whinged about her and who consequently now have no career prospects whatsoever. Doubtless he will pool ideas with Christopher Pyne, the other, fixer, albeit self-proclaimed, in the ranks. Work experience boy, Environment Minister Greg Hunt added more utter nonsense as he presented his Direct Action assignment creatively rendered in noxious clouds of choking coal smoke signals. Hunt’s Direct Action means that government not only pays our taxes to polluters to reduce pollution, it now promises no real guidelines to measure that reduction. This is world’s best practice we are assured. Any other industry gets a ‘guideline’ based on its peak pollution level over its last five years’ operation. The Climate Institute’s Erwin Jackson sees the policy as a ‘Claytons’, a ‘climate policy you have when you don’t want to reduce emissions.’ Safeguard provisions amount to a Newspeak term for no safeguards at all. How the Direct Action fairies will reduce pollution is anyone’s guess but we all recall Greg telling us he ‘just knows’ it will work. We hope he is not relying simply on our reducing electricity usage to meet his targets. At least he didn’t have to change the law as Brandis just has. Hunt’s love of coal-fired power is in marked contrast to his declaration of war on solar power companies whom he threatens to investigate, pink batts style, claiming 15 per cent of the 1.3 million rooftop systems in Australia are substandard and potentially unsafe. Yet Australian Solar Council head, John Grimes says that under the Abbott government a safety advisory committee of the regulator has not sat once. Mr Hunt had not shown any concern about safety despite being handed three reports in his time as minister, he observes. Brandis sighed happily as he helped Australia towards becoming a police state when his new metadata retention legislation was passed by the senate. It will become ever harder to hold government to account, criticise or even scrutinise as the state gained the right to access our metadata whenever it feels like it, for whatever reason, unless you are a journalist in which case a summons is required, although this will most likely be swiftly and readily provided by an obligingly sympathetic judge without unseemly delay in 2017 when the new law comes into effect. Ordinary citizens stand to discover for themselves the ways this data can be used by a range of agencies to follow up even minor misdemeanours such as unpaid parking tickets. The government was assisted by a feeble Labor government which needs to trade up its leader and a bewildered, incompetent senate which meekly fell into line with Big Brother. A recent guest on The Drum, a much better website than a current events show, said his mates were not worried about it round the BBQ as if apathy and wilful ignorance were somehow some immunity to tyranny. Contenders for star performer for the government faced stiff competition but must include Health Minister Sussan Ley who proclaimed that reversing the decision to cut funding to domestic violence victims is a policy triumph. How a backflip represents a wise decision, or a government at the cutting edge as she unfortunately put it, is beyond comprehension. All funds are needed and this reversal must be followed by scrapping the $30 million awareness programme and giving the money to outfits which provided women with urgently needed shelter, protection and support. Further funds may found in an efficiency dividend applied to Abbott’s ministry for women. Given that Tony Abbott made himself Minister for Women only as a calculated snub to those who advocate justice, sexual equality and equal rights for women, Ms Cash’s assistant role remains problematic. If she continues to be subservient to Abbott whose dim and crazy view is that we have shattered all available glass ceilings, women would be better served by putting Ms Cash’s allowance into support for needy families suffering all over the nation from our epidemic of domestic violence, a violence experienced by one third of all women by the age of 15. Every week two Australian women die by from male abuse. Yet we pay more attention to two lives, albeit tragically, lost in a plane crash in an apparent pilot suicide. Savings to fund programmes to address our domestic violence crisis could be made in our defence budget by scrapping a submarine or two. Even smarter would be to save at least $5 billion a year by bringing our advisers home from Iraq. Three Iraqi militia units who support the US- Iraqi assault on Tikrit have just withdrawn and refuse to fight saying they do not trust the United States. Doubtless our advisers, with Kevin Andrews’ counselling skills could correct this little rough patch in an otherwise healthy relationship rooted in mutual distrust, hatred and competitive self-advantage. Failing that Andrews could kick a goal for common-sense and humanity by calling our troops home before they are irretrievably enmeshed in another military fiasco. Put the money into combating a real evil at home. Chip in the $2.5 billion ear-marked for Direct Action, a total waste of money and you’ve got a sum which can be put to good use immediately. Of course millions in small change can be found instantly simply by dismissing all those spin doctors and media gurus who are even more redundant judging by the way the government’s message has continued daily to be totally incoherent. Then there’s the carbon tax which did have a chance of regulating carbon emissions and providing a handy source of revenue. None of this is pie in the sky given the extent of government back-flips and reboots so far. Yet any of it would be a victory for humanity and justice and a brighter future for all of us. Now that Labor has achieved a good result in NSW and is revitalised, the Liberals who are poised to dump their increasingly crazy leader could make their move and make these much needed changes – if only they could read the writing on the wall. Yet instead, Abbott is likely, bizarrely, to claim some sort of vindication and crow and boast and make even more lunatic captain’s calls as his party, riven by leadership rivalry, drifts with him inexorably into the arid social wasteland of neoliberal neglect for the people in its pursuit of tea party small government and its mindless veneration of its cruel, false, free market god. Julie Bishop gets her message out. An astonishing event in Canberra has seized the nation. Reeling from a record-breaking run of defeats, self-sabotage, own goals and sundry other debacles, a terminal Abbott government has defied the odds and at last notched up a win – of sorts. It has got its message out. The victory is all the more remarkable given the Liberals’ record of deceit, evasion, broken promises, budget of injustice and studied disdain for any notion of governing for all Australians. Yet, rampaging madness aside, one run for Team Lazarus appears on the board at last. A few more skewed polls, News Corp propaganda and even a modest Baird victory in NSW on Saturday will have the party high fiving and twerking in the streets; crowing with righteous vindication and as out of control as a mob of schoolies on the Gold coast in December. Its coaches and supporters confused, worn out, worn down or just plain stood down like Credlin on Murdoch’s orders, Team Abbott’s forces appear in total disarray. Now out of control in Credlin’s absence, his government has a future only in the history textbook, to be studied avidly by students of political dysfunction, with an interest in a government misled by its own rhetoric; routed by its own incompetence. ‘We need to get the message out’ its leaders continue chanting at the half-time huddle; ‘get the message out,’ but suddenly the message is confused, scrambled by Captain Qeeg Abbott declaring the scoreless first innings over. He knows his onions, Tony Abbott, he claims, waving papers and making strange facial movements as he does before he speaks or eats random, unusual root vegetables. Suddenly skipper Abbott, is happy with the economic picture after all. He flourishes graphs which he says show we are ‘on trend’ to a miraculous near-recovery in five or so years. The line plummets into disaster ever after but, hey, he’s a glass half-full type of skipper and besides, his team must rest their heavy lifting muscles. Why, ‘we get very close to balance’ he grins, waving his own copy of ‘The Intergenerational Report,’ another lame work of propaganda he’s spent a fortune flogging. Another Goebbels line pops into his head but he controls his impulse this time. Yet the image says everything. 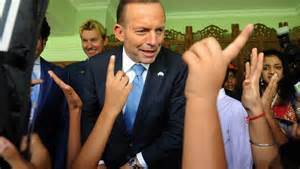 Flapping his pages, like a Tibetan prayer wheel Abbott explains, Qeeg-like why after rejection of the budget by the Senate and the people of Australia, he has brought HMS Team Abbott to a full stop. The ‘good captain’ lets the crew know that they have done more than enough already, compared to Labor, if Labor were elected, ignoring data showing bigger deficits than anything his government had inherited; and continuing insanely to claim a better result than Labor would have achieved had it been re-elected and ignored the deficit. God knows what he will do when the prohibited substances or the beer goggles of Murdoch’s Newspoll predictions or sycophant Ackerman’s helpless, hopeless, lovelorn ranting wears off. The scoreboard, however, records its own clear message, the team is always getting out. Or so it went until only yesterday when the plucky little vice-captain, working a stray ball from the edge of Hockey’s bat off her left leg, played a blinder with her eyeballs. Julie Bishop gets her message out, a message which shows clearly that she is not happy to have been excluded from the decision. Also signalled is that she is not a team player. Bishop has never been a team player, but in a Liberal team of every woman for herself this itself should not be held against her. She lets the team know, however, by mugging for the television camera, rolling her eyes at Joe and shaking her head. Amidst its elephantine, public lamenting of the death of the dead wet Liberal Malcolm Fraser, a prolonged, outpouring of dutiful affection and ritual laceration, to rival Whitlam’s wake, a cocky Joe Hockey overshares by airing his own disturbing, dirty little secret. Bishop purses her lips, fit to kill and stabs exquisitely manicured and lacquered fingers savagely at her Blackberry. If only she had done the same when, in opposition, she looked on fondly while Abbott used every dishonest and misogynist trick under the sun to attack Julia Gillard. Hockey extols his love of razor gangs and the power it gives him to deny others, erupting, mid-eulogy, a mourner transported by grief, political opportunism, and vanity, a mad ham actor amidst the obsequies, arms outstretched theatrically like Moses stopping battle, forlornly, re-enacting his inner need for authority, acknowledgement, approval. Someone once must have said, ‘Jeez you’re a dag, Joe,’ so full of it, you should be in parliament.’ And Joe believed them. Hockey bores on inexorably on the virtues of the departed when, suddenly, he changes his narrative and gains everyone’s attention. Pollies pause their yawning, texting and checking of email. Emojis are abandoned for a moment. Waxing to his theme, he announces his government has again pilfered the small change now left in the Foreign Aid budget, funding so subject to depredation it is now a pittance, a tiny, useless, token amount, such as Apple, BHP or multinational may pay in tax under Liberal governments in Australia. Australia’s foreign aid budget, which has already suffered $11 billion in cuts since the Coalition was elected is like a magic pudding be cut again in May in its second budget carve up. The ERC or expenditure review committee is extolled as another of Saint Malcolm’s ever expanding list of achievements. Razor gang founder; architect of world peace, multicultural harmony, trouser loss and depositor of pickled onions in guests’ pockets at parties, Frazer is a veritable Mother Theresa, Gandhi and Martin Luther King whose ruthless ambition caused him to bring down a lawfully elected government in a Machiavellian conspiracy of squalid, ruthlessness, class hatred and petty advantage. While Hockey performs his lumbering parody of a conviction politician, Bishop, another parody in waiting, upstages him by revealing her displeasure. Joe would eat his words; do her bidding, grovel and beg on his knees before her but it is Turnbull who pulls off the master stoke with his deadpan line to camera on morning television. Joe wanted us to respond like that, he grins archly, it was that sort of speech. Joe wanted us to roll our eyes and shake our heads. In less than twenty four hours, the Liberals have broken their run scoring drought. 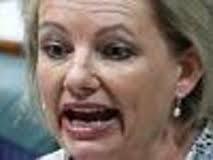 Bishop has communicated with the nation through the eye of god without Credlin or her husband’s prior permission. With head and eyes alone, Bishop has spoken volumes about Liberal disunity, division and selfish ambition. In a gesture she has shown us all the worth of her captain’s reassurances about consultation and communication. It is a victory of honest communication for a government of deceit and utter dysfunction, which despite its message wants to keep its true message in not risk it getting out, but after last Monday’s non-verbal stoush, no-one need be in any further doubt. Fraser’s spirit was alive and well, its legacy inescapable even in Abbott’s reborn, revised, revamped, consultative neo-Liberal party. ‘Fixer’ Pyne reveals much more about the Abbott regime than it may seem. When Christopher Pyne called himself ‘The Fixer,’ on Sky TV, recently, audiences guffawed and fell about helplessly, hooting with derision as another of the Abbott government’s star performers seemed to attain new heights of comic absurdity and grandiose self-delusion. Pyne’s performance eclipsed even Scott Morrison’s claims that indefinite detention of children was an act of mercy and that on Nauru, Save the Children staff had ‘coached’ detainees to stich their lips and falsely claim sexual assault, both now shown to be false in Philip Moss’s report. He almost outshone his master, Tony Abbott who has just said things happen and shrugged aside the report’s finding. Pyne, more than any other clown in cabinet, has helped his Prime Minister elevate governing to a new level of absurdity. The surreal humour in David Speers’ interview on Sky lies partly in Pyne’s past failure to fix anything, let alone counselling cross-bench senators, such as Glenn Lazarus who appears about to take out a restraining order on him. But there is more to it than comic incongruity or the minister’s industrial-strength chutzpah. Pyne’s inane grin signals some deep inner peace, if not pleasure, in challenging our expectations. Moreover, it tells Speers and his audiences exactly what he thinks of them; it is a gesture of contempt. And if his back-flip was bewildering; Pyne has learned well from Abbott his master. Pyne’s gun-at-their-heads terrorist negotiation tactic had been dropped overnight. 177 researchers could continue to receive wages and feed their families. Universities would no longer be threatened with massive cuts to research funding unless enough cross-bench senators approved to pass the bill; another ideologically driven delusion of a tertiary sector where fees would rise and take standards and everything else up with them. Everything was fixed. Pyne just was not going to say how. Like his boss, everything bad was behind him, we were moving forward, he promised, grinning like a Cheshire cat. When Speers asked Pyne for details of his new-found funding fix, the Minister simply refused to tell. It was a watershed moment in his government’s history. It redefined and refined the doctrine of Westminster responsibility to a tissue of invisibility. Pyne has taken government to a higher metaphysical plane. His non-interview with Speers was either pure Dadaist non-politics or a type of Zen mysticism. Commentators flocked in hordes to applaud the ensuing, absurdly surrealistic exchange, acclaiming it as worthy of comedic giants John Clarke and Brian Dawe. Laughter, of course, must not distract us from the hard facts. Pyne is a major contemporary political figure. Whilst he may entertain and divert us, he also busily refines the essential absurdity of his fantasy government, a surreal government which came to power in a puff of smoke, not by virtue of any real platform but by dint of simply not being Labor, a Dada government which took office with its feet permanently planted in the clouds, its head turned firmly away from Labor and the sordid, fallen world of the ordinary voter. Pyne is chief custodian of the Abbott regime’s anti-government castle in the air. He embodies in word and deed an unreal government which bought office with a blizzard of false promises; a government which from inception created a trust deficit, which, together with its contempt for explaining itself, or being held to account, has ensured its future impotence and unpopularity. With the manifest arrogance of God’s anointed or the born to rule, it saw no real need to communicate, let alone negotiate, preferring instead to dictate the pace; act first and apologise afterwards; announce first and attack critics later enacting metadata retention laws to further frighten off dissent. It is tempting to dismiss Pyne as a privileged Peter Pan whose plummy voice and arrested adolescence appeals to the old ladies of Sturt who receive signed birthday cards from him and who vote for him in droves. Yet that would be to overlook the consummate performance artist in him. Pyne’s stock in trade, his ‘shtick’ is serious self-parody. He is a kamikaze politician, like his gaffe-prone leader, Tony Abbott whose efforts more often get him into trouble than out. Yet like his master, he can grin and say sorry. Or just grin, turn around and dish up another serve of complete codswallop. Thus Pyne continues at the wheel of the LNP vehicle, spinning the tyres, doing burnouts and sliding all over the track with boyish delight. That he gets nowhere is beside the point. It is Pyne’s deathless derring-do, his manic energy and single-minded determination to stay in the game – almost any game – at any price that is his vocation, his unique contribution. His plummy words are but puffery. Even he doesn’t expect us to really believe them. 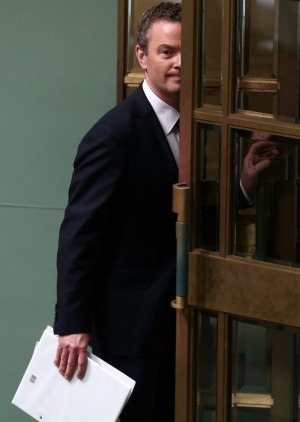 By all conventional accounting, Pyne has a record of resounding defeat and underachievement in the Education portfolio and his latest nobbling of the government’s darkest horse in its privatisation stakes, Higher Education, fell at the first hurdle because he had not bothered to first make a case for change. Other Education Ministers would have negotiated or sought advice from experts such as Peter Dawkins, David Phillips or Bruce Chapman. Instead, it was easier for Pyne just to follow the same path that had led to power and make things up. Lies are no substitute for building a case for reform, however liberally sprinkled, and Pyne’s two fundamental lies are whoppers. It is a lie to claim that there is a financial crisis in education funding and it is false to pretend that there is anything wrong with higher education. The government commits similar amounts of funding to private schools as it does to tertiary education yet never once has it proclaimed any crisis in funding parents’ right to choose their children’s (private) schooling. That would not be risky; it would be foolhardy. Pyne will take risks to be Abbott’s fixer. Witness his role in the ‘fixing’ of Peter Slipper, a dangerous liaison which he cultivated for as long as it took to achieve a result. Although he maintains he promised Ashby no position or any other form of inducement to press charges against Slipper, it would be wise for him to hush this over as best he can. As tempting as it may appear, however, it would be unwise to dismiss ‘The fixer’, as simply delusional. Pyne’s role in shaping the Abbott government’s style and direction is significant. In his voice is money, privilege and droit de seigneur; in his antic disposition appears his party’s flight from reason into blind faith in neocon ideology. Pyne shares with Abbott the same sense of vocation. Each is a type of priest in the ritual adoration of the sacred free market life force and other assorted Tea Party received truths. Both worship the gods of small government, small business and the much-lauded, miracle-working capitalist entrepreneur who makes all things possible to all men whilst praying for lower wages, fewer conditions and other ‘flexibility,’ to be granted by a good and faithful servant government, amen. Yet Pyne is the acolyte; Abbott his adored master. Pyne is the quintessential Abbott courtier who has given his all to his government’s abortive radical neoliberal ‘reform’ programme. As Leader of the House, he has also, moreover, made his mark on parliament, snubbing democracy as befits the truly anointed member of the elect, deploying tactics such as privileging the ‘Dorothy Dix’ in question time, elevating time-wasting to an art, presiding over a parliamentary theatre of ridicule and simultaneously prosecuting his party’s contempt for reasoned discourse, decorum and common sense. Historically, every monarch’s court had its jester or fool but few have been gifted with a Christopher Pyne. Just his unstoppability and his commitment alone command our notice if not our admiration. Energiser-bunny Pyne has tirelessly, selflessly, devoted his phenomenal energy to being a clown. Time, then, we gave him due credit for his sensational performances, especially his gift for self-deprecating absurdity, and considered him in his own right. So popular has Pyne become as a laughing stock that he almost upstages his Prime Minister whose back flips, onion eating and zany captain’s calls have the nation in stitches. Abbott’s one-liners are head and shoulders above any of Shorten’s zingers. Only last week he boasted that he ignored metadata when he was a journalist. Yet his brief abortive career as a scribbler was over well before the Internet was in use in Australia. Abbott, like any good captain, sets the lunacy bar high. Yet Christopher Pyne is not about to give up. Undeterred, undaunted, the Pythonesque Black Knight is heroically resolved to fight on with his teeth if need be in the service of the surreal, fantastical, castle in the air that is the Abbott government. Whilst some pragmatists see clowns merely as useful distractions, the role of the Education Minister is more complex, fashioned from the very essence of the fantastical yet fanatical neo-con theocracy that Abbott and his backers have installed to rule over us. Rather than dismiss him as some hopeless eccentric we should consider Pyne more thoughtfully for what he reveals of the workings of the Abbott government as a whole, a government which leans more towards performance art than politics, a government informed by an ideological fantasy of a neoliberal ‘hands-free’ approach to the very hands-on challenges of being a successful government. Abbott and Hockey are playing Australians for fools in the IGR’s dog’s breakfast of lies and half-baked nonsense. Side-stepping convention, tiptoeing around the climate elephant in the room, Joe Hockey shrugs off precedent and other reasonable expectations to promote his narrow, political and partisan Intergenerational Report, a propaganda piece which is less an honest estimate of future trends than a final, desperate dose of shock therapy to the LNP’s own black dog of despair, its own budget mess. The report is a dog’s breakfast of lies, half-truths and half-baked statistics all rehashed in a neoliberal ideology blender. Sloppy Joe Hockey wants his IGR to begin a national conversation about our future, yet surely even Hockey cannot expect any real dialogue when he and his government are unwilling to act in good faith. The report needs to speak the truth. It fails the test of credibility. Some of its lies could just be sloppiness: early in the piece’s executive summary, current Australian life expectancies for men and women ‘are 91.5 and 93.6 today.’ Yet the ABS figure is ten years lower than that. There is a bit of a push on from the Abbott government to abandon the frippery of census taking and other hard empirical data gathering but until that happens, the ABS figure has the ring of truth. The error rings alarm bells. This IGR is light on for accuracy. Similarly, the IGR plays fast and loose with the truth about projected government income, population growth and even boosts its own performance figures by factoring phantom income such as its abandoned GP co-payment and other measures which have been blocked by the senate. Its pretence at prognostication, to one side as a bit of window dressing, this IGR sets its sights on the here and now. The report is a big gun in a campaign to strike terror into our heats and stampede us into accepting austerity budgeting. But it is deluded if it thinks it has kept its powder dry and that its scare tactics have not lost their shock value. Can it not see it has cried wolf too often? Forecasting is a risky business at the best of times and never more so than with the imperfect science of economics. None of the previous IGRs have come within a bull’s roar of getting their budget estimates right. You need clear aims, rigorous methodology and quality data. As Richard Denniss notes the garbage in, garbage out principle of computation applies to this IGR in spades. Even if you just want to scare people, you need credibility. Joe Hockey fails to meet any of these requirements and instead must fall back on blind neoliberal faith and ignorance if not stupidity. Stupidity is repeating the same mistake and expecting different results. Change the record, Joe. Fools enjoy a natural immunity from self-awareness and the Great Helmsman Abbott is happy to sail into the wind taking his bearings from false soundings. Anything but change course to accommodate science and reason. Undeterred by the prospect of his leadership’s imminent ship-wreck, the fool-hardy Hockey fudges numbers to fake impending economic disaster. We are all doomed: only he and his government’s fiscal austerity medicine can save us. The Abbott government’s IGR paints an incredible future scenario in which everything governments do remains the same for forty years. Governments continue to lower income tax rates each year while deficits rise, an unimaginable if not absurd prospect. What the states’ economic lives contribute to the changing picture is never contemplated. Nor is the reality of the cost of changes in our weather. Joe is making his own arbitrary decisions for his own reasons: his own captain’s call. Climate change doesn’t matter a damn and Labor never gets back into power or brings back a carbon tax. True intergenerational theft is the province of the climate change denier whose influence is at work in this one-eyed squint at the future. Technology never evolves nor could it ever make work more possible, more profitable. There is no thought given to the potential of a healthy renewable energy industry nor the boom it could bring not just to lower power costs but also to exports. The scenario shows how small changes can make a huge difference, and highlights fruitful future areas of investment if we are truly concerned to address the costs of our aging society. Rather than concern itself with solutions, however, the report takes a different tack. The IGR scapegoats an ageing population for raising health costs. Pressure on the system, in fact, comes from the wealthy wanting to be healthy. They then purchase ever more expensive government health services. The elephant in the room of climate change is invisible to this government. The biggest threat we face in 2055 will be a budget deficit, according to the report’s authors who appear trapped by a tunnel vision and happy to ignore the facts and all previous warnings. Or is it that they suppose that Greg Hunt’s direct action has climate change safely under control? It seems more like avoidance: turn your back on it and it will go away, an unbecoming if not downright dangerous attitude in any would-be forecaster. Either way it’s an act of wilful negligence that further undermines its flawed economic forecasting. Or has the lesson of the IGR become only that we can safely ignore the last one? The last IGR warned us ‘the largest and most significant challenge to Australia’s environment. If climate change is not addressed, the consequences for the economy, water availability and Australia’s unique environment will be severe”. Australians deserve better than to be played for fools over their future. Hockey has transformed the Intergenerational Report from its use of data to model future scenarios to prompt informed debate beginnings as it began in 2002 into something which is not about the future at all. It’s all about Joe. And Labor is to blame. Everything the Abbott government ever set out to do was right on track and all that needs to be done is for those Labor bastards to drop their opposition, that mongrel senate to fall into line and the budget will be passed at last and we’ll be back in surplus tomorrow and forever after. The report has the graphs to prove it. It’s only because of Labor that things aren’t perfect already. Cuts must be made to balance the budget. Nothing else matters. Hockey’s report will go in the waste bin along with its Commission of Audit and other failed attempts to soften us up for more cuts to government expenditure. Expect to be blitzed, nevertheless with an advertising campaign telling us we are living beyond our means. No expense has been spared. Funding of advocacy groups is threatened; emergency accommodation for women seeking refuge from domestic violence has been slashed yet Joe can blow $380 million on an ad campaign to frighten us into submission. Hockey’s IGR is propaganda masquerading as prediction. If Hockey is serious about ‘having a conversation’ with Australians about our future then he needs to put up some honest data. He’s missed the boat with this report. But has he ever been remotely interested in any conversation which doesn’t tell him what he wants to hear? The Treasurer is so desperate to claw back lost opportunities that he will even politicise an IGR if he has to. Even if it means, as is highly likely, he kills it off. Hockey has abandoned all pretence at a forecast based on best available information as a responsible public service or even duty. Instead he has concocted a fiction to serve his party’s narrow political ends in the hope it might rescue his political career. It is unlikely to make his political future any less uncertain. What is certain is that whatever shape is taken by our budget and the economy forty years hence it will bear no remote resemblance to any scenario presented in this so-called ‘report.’ Certain also is that the Australian people will see through this tissue of lies and see through the ensuing campaign assault on their common-sense and intelligence as a desperate government abandons any remaining good faith and turns to fear-mongering about the future to save its own self interest because it can make no larger plan. The Hockey horror show desperately tries to terrify a nation it has failed to persuade. 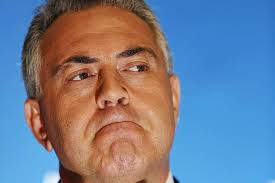 Australians are falling off their chairs, all over the nation as they guffaw, hoot and cackle with laughter at the latest offering from the Federal government’s veteran entertainer, Joe Show-biz Hockey. Just as he predicted. Almost. Well, he got the chairs bit right. Lenore Taylor says it’s not scary. But then she spoils it all by giving reasons. Typical. She’ll never be on Team Australia. Trust is what’s called for. Respect. True belief. All long gone, you say. Just you watch. The show’s the thing. From its catchy title to its up-beat, all-singing, all-dancing closing finale, ‘Living within our means’ with its touching chorus of colourful elderly beggars plaintively singing about their love of poverty, constant hunger, ill-health and the freedom of living rough whilst being moved on by riot squads of heavily armed police, The Intergenerational Report is a gag a minute family show which has everything; a great cast, a classic plot and some wonderful numbers. “assess the long term sustainability of current Government policies over the 40 years following the release of the report, including by taking account of the financial implications of demographic change”. Centre stage, Costello’s fingers are raised in what seems to be a gesture of benediction or perhaps a victory salute. The smirking doll is worshipped by all characters at the beginning of each act until it is smashed in the finale, bursting open in a ticker tape parade explosion of receipts from the sale of the resource boom and other assets. It is a rich spectacle in a show that takes the incredible into a realm well beyond mere disbelief. Costello’s other hand bears a future fund brief case with over a hundred billion dollars in it which is rescued by a regiment of Iraqi commandos and quickly borne off stage before anyone even thinks of settling any debts. The most spectacular gag of all, however, is that ordinary punters pay a small fortune for our tickets while multinationals get in almost free because they provide jobs. We must not upset them by asking them to pay their fair share of tax or they will bugger off and leave us to exploit ourselves. Just think of it as spending money to make money, impresario Hockey says. Spending your money to make them money. They are needy and deserving is his punch-line. Quality entertainment is never cheap but look at the cost of funerals these days. Or dental care. The IGR plot is surreal. It creates the most implausibly fantastic future scenario: ‘No carbon tax, not never and policies to stay the same for ever,’ goes the chorus. No change for forty years but government will lower income tax rates every year. Labor either never gets elected or its carbon tax policy is not reintroduced. Technology never evolves nor makes work more possible, more profitable. There is no ink wasted on the renewable energy industry nor the boom it could bring not just to lower power costs but also to exports. ‘Blame it on the old; their lives are over’ is a toe-tapping Bossa Nova number which scapegoats an ageing population for raising health costs. Pressure on the system, in fact, comes from the wealthy wanting to be healthy. They then purchase ever more expensive government health services. The old are hunted down by work for the dole youths and deported into work camps. Our current Treasurer, it is true, struggles a bit with numbers or economics, but give him his due. He makes a great fiddler. And what an act! We should scratch Sebastian and enter Joe in Eurovision. A versatile comic genius, he effortlessly combines parody and pantomime and tops it all off with shlock-horror served with lashings of vaudeville. Everyone gets a chance to hiss the Labor villain right through the show. He’s right behind you! No. Over there. On your right! In 2055 the budget is finally balanced on stage with the assistance of a small tactical nuclear device. Climate change is not even a cloud on the report’s horizon because doubtless, factored in is the certainty everything will be fixed by all that direct action that the government is taking. Whew. Or is it that old standby: turn your back on it and it will go away. Either way it’s a shaggy dog story at best. The last IGR warned ‘the largest and most significant challenge to Australia’s environment. If climate change is not addressed, the consequences for the economy, water availability and Australia’s unique environment will be severe”. Great we’ve cleared all that up. Nice one, Joe. 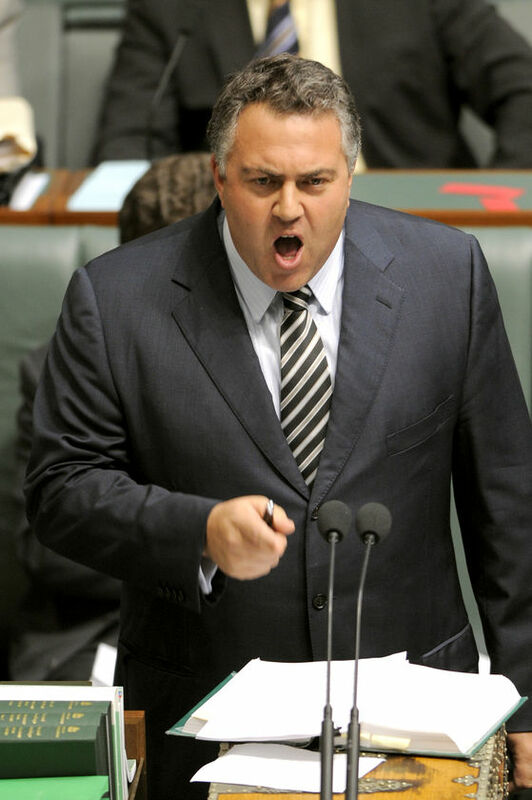 You have got to hand it to Joe Hockey. He’s really thought this thing through. Talk to me while I lie and frighten you is an approach which commands respect even if it is the rapid step back to create personal space we deploy to safely distance ourselves from the dangerously insane, the intellectually challenged or the nice bicycle brothers heaven sent in suits and sure of themselves all the way down to their patent underclothing who visit your home to chat about God’s Word, Satan’s wicked ways and how to stay out of Hell. It’s a hell of an act of faith to think you can scare the nation peddling lies and false testimony, making false prophesy and then expect folk to want to talk to you ever again. Or a last, dumb, desperate gamble from a man who knows this is the last time ever the country will suffer an IGR of his making, a man who must know in his water that he will be lucky last past the NSW election. In the meantime, enjoy the show for what it is, the triumph of deluded self-belief and ignorance over any form of science or better judgement. What better epitaph for a government that never rose above an opposition, a party that was elected not for what it might do but because of what it was not, a government so blinded by its far right ideology that it never came close to being in touch with reality.